Mr. Martin Kaufman was educated at Yeshiva Universty and New York University"s Graduate School of Business Administration. Was Chairman and CEO of Philipp Brothers, formerly one of the world's largest commodity trading companies. He is a global consultant to entities in the financial and natural resource sectors all over the world. Mr. Kaufman has lectured extensively in numerous Adult Education programs for many years and presently gives shiurim in the New York City area. He has also served on two boards of Yeshiva University, amongst many other Boards. Mr. Kaufman lives in Manhattan with his wife and three children. In this course we will discuss the multifaceted concept of "Tzelem Elohim" as presented in the Maharal's Tiferet Yisrael. In what way is the Jewish people the Chosen Nation? What does it mean to be "chosen"? Chosen for what? The Maharal's "Tiferet Yisrael" provides a set of answers through its philosophical exposition showing how the Torah rests upon the unique nature of the Jewish people's chosenness. Torah learning on WebYeshiva.org in Spring Semester 2017 is dedicated in the memory of Yehezkel and Sarah Lemel z”l by their loving family. יחזקאל בן אשר למל ושאשא יוכבד ז”ל ושרה מניה פייגע בת יום טוב וטשארנה רבקה ז”ל Click here to learn about their inspiring stories and passion for Torah education and Israel. To find out more about dedication opportunities with WebYeshiva.org please contact office@webyeshiva.org. The Fifth Cup and Hallel HaGadol as elucidated in Maharal's Gevurot HaShem. In this course we will specifically explore Maharal's analysis of the culminating latter part of the Seder, including Birkat HaMazon (Third Cup), Hallel (Fourth Cup) and lastly, the Hallel HaGadol which is the Fifth Cup. Maharal beautifully portrays the transition within the Seder from historic narrative to recognition and appreciation of being Am Yisrael, and finally, to the most joyous, ecstatic outpouring of Thanksgiving existing within the entire body of Jewish liturgy. What qualified Esther to become the Redeemer of the Jewish People? To answer this questions, we will study the Maharal's thesis from Derech Chaim. The Maharal of Prague created a lot more than just a Golem! He wrote several monumental works such as the Be'er HaGolah which establishes the parameters for the proper study of Aggadah, the enormous non-legalistic Rabbinic component of the Talmud. His approach reveals the profound depth of wisdom of the Rabbis, specifically within this somewhat neglected area. The shiur will study Maharal's analysis of 16 amazing Aggadot in Be'er 4, whose literal meaning poses serious questions to the logical mind and the Believer's faith. Who and what are you returning to? That is the question and the answer will affect your future. 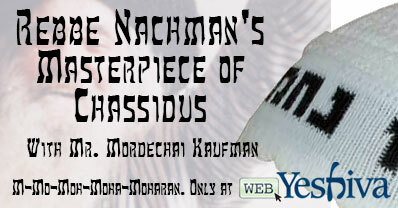 In this course we will learn Rebbe Nachman's Masterpiece of Chassidut, Likutei Moharan, in which we will explore some of the basic Lurianic Kabbalistic foundations upon which the creative genius of Rebbe Nachman's system of personal Tikun is built having as its ultimate objective nothing less than the perception and connection to Hashem. For the previous classes in this course, please click here. This class will study Maimonides' major philosophical work, The Guide for the Perplexed. Although it is a continuation from previous semesters, new students are encouraged to join. This semester we will finally conculde the book. For previous classes please click here. In this course we will learn Rebbe Nachman's Masterpiece of Chassidut, Likutei Moharan, in which we will explore some of the basic Lurianic Kabbalistic foundations upon which the creative genius of Rebbe Nachman's system of personal Tikun is built having as its ultimate objective nothing less than the perception and connection to Hashem. For the previous classes in this course, please click here. In this series we will focus on the centerpiece of the Haggada based on the Maharal's book "Gevurot Hashem". Throught the three weeks, we will study three paragraphs central to the theme of the Haggada; Ha Lachma Anya (This is the Bread of Affliction), Ma Nishtana (How is this Night Different from All Other Nights?) and Avadim Hayinu (We Were Slaves). This class will study Maimonides' major philosophical work, The Guide for the Perplexed. Although it is a continuation from previous semesters, new students are encouraged to join. The role of Repentance is fundamental in Maharal's intricate blended thought system of philosophy and Kabbalah. It is intimately connected to widely developed basic concepts in his written works such as the nature of Man, Creation, Providence and many more. We will explore some of these basic fundamentals and contextualize them within Maharal's overall system. This class will study Maimonides' major philosophical work, The Guide for the Perplexed. This class will study Maimonides' major philosophical work, The Guide for the Perplexed. It is considered to be the most influential book of medieval Jewish philosophy. This class will study Maimonides' major philosophical work, The Guide for the Perplexed (Morech Nevuchim). It is considered to be the most influential book of medieval Jewish philosophy. This class will study Maimonides' major philosophical work, The Guide for the Perplexed.Â It isÂ considered to be the most influential book of medieval Jewish philosophy.